Despite the long history of rubber as a construction material, this book is a unique publication as it comprehensively looks at the material with respect to the anti-corrosion requirements of the multitude of industries where rubber is used, both on land and offshore. This guide documents how rubber reliably meets the threats of corrosion and contributes to the longevity of the equipment. Chapters on ebonite, natural, and synthetic rubbers, examine their relevant properties and chemical resistance. The book details the practical aspects and handling of rubber lined equipment: thin-walled structures, vacuum vessels, ducts, large diameter tanks, agitators, and fully lined pipes (both inside and outside). Molded and fabricated products of ebonite and soft rubber as well as hand-made rubber products are shown along with vulcanization technology, testing and inspections, measurements and standards. 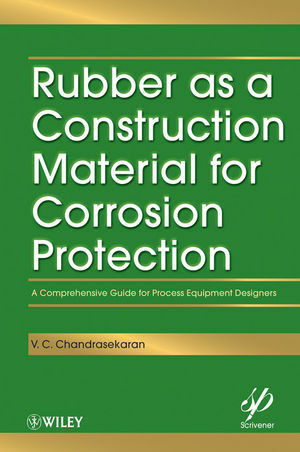 Several case studies are included demonstrating the preferential choice of rubber as a construction material as well as practical applications and techniques of its usage in the chlor-alkali, fertilizer, mineral processing and other core chemical processing industries, which are the largest consumers of rubber as a material of construction. The volume ends with a section on aging and prediction of service life. Rubber as a Construction Material for Corrosion Protection will be used by chemical engineers, rubber technologists, students, research workers worldwide in the rubber industry and process industries such as fertilizer, mining and ore, oil & gas, paper and pulp, steel plants, as well as people engaged in corrosion protection. The book will also be very useful to the construction industry. V. C. Chandrasekaran earned his B.S. Chemistry at the American College, Mathurai in the fifties and did his LIRI (UK-Indian Section) in the sixties in rubber technology and was one among two gold medalists in India. He has served the rubber industry for more than four decades and has been associated with the chemical and mining process industries for a long time as well. He has presented technical papers on rubber in various national and international seminars, and has published books and journal articles with leading publishers. During his service with the Indian Ministry of Defense he was instrumental for the indigenisation of airborne rubber items for Russian and British aircrafts, helicopters, and other air weaponry. Currently, he is engaged with Can C Consulting India providing consultancy services to the chemical process and rubber industries. 1. Introduction - Background and Reasons for Using Rubber as a Construction Material. 1.7 Rubber Protects Corrosion Effects. 1.8 Rubber Gives Thermal Insulation. 1.9 Rubber Gives Passive Fire Protection. 1.12 Rubber Bonds with Metal. 2.5 Property Requirements of Un-vulcanized Rubber. 2.6 Property Requirements of Vulcanized Rubber. 2.7 Basic Changes in Properties. 3.5 Synthetic Rubbers Which Can Be Converted into Ebonite. 3.6 Technological Aspects of Ebonites. 3.8 Main Properties Exhibited by Ebonites. 3.10 Vulcanization in Relation to Properties. 3.11 Rubber-sulphur Ratio and Cure Time. 3.15 Shape Reduction During Cure. 4. Rubber Lining - Types and Application Procedures. 4.1 What is Rubber Lining? 4.6 Control of Operating Conditions. 4.8 Codes of Practice Relating to Corrosion. 4.9 Types of Rubber Lining. 4.10 Application Procedures for Rubber Lining. 4.15 Application of Calendered Sheet. 4.16 Inspection of Rubber Lining. 4.18 Sheet Laying and Rolling. 4.19 Lining Procedure for Pipes. 4.20 Storage of Rubber Lined Pipes. 4.21 Design and Fabrication of Lining Supports for Handling Lined Equipment. 4.22 Surface Preparation for Rubber Lining. 4.23 Methods of Surface Preparation. 4.24 On Site Rubber Lining. 5. Rubbers and Their Relevant Properties for the Chemical and Mineral Processing Industries. 5.2 Elastomer Types According to American Society of Testing Materials-ASTM D2000. 5.6 Resistance to Wear and Tear. 5.14 Styrene Butadiene Rubber (SBR). 5.17 Chlorobutyl (CIIR) and Bromobutyl (BUR). 5.18 Ethylene Propylene Rubbers (EPM and EPDM). 5.23 Thiokol or Polysulphide Rubbers (T). 5.24 Polyurethane (AU or EU). 6. Design Considerations for Fabrication of Equipment Suitable for Rubber Lining. 6.3 Metal Defects Detrimental to Rubber Lining. 7. Chemical Process Plants and Equipment. 7.2 Flue Gas Desulphurization Systems (FGD). 7.3 Water and Waste Water Treatment Equipment. 7.4 Nuclear Power Water Treatment Plant. 7.7 Hydrochloric Acid Handling Equipment. 7.8 Sodium Hypochlorite and other Bleach Equipment. 7.9 Gold Ore Processing Equipment. 7.16 Industry Equipment and Components. 8. Processibility and Vulcanization Tests. 8.1 Critical Properties of Rubber. 8.10 Plasticity and Viscosity Test Methods. 8.18 Specifications and Codes of Practice. 9. Rubber to Metal Bonding. 9.1 The Rubber Bonding Process. 9.3 Selection of Bonding Agents. 9.6 Application of Bonding Agents. 9.7 Adhesive Manufacture for Ebonite Bonding. 9.8 Moulding of Rubber-Metal Bonded Product. 9.9 Compounding of Rubber for Metal-Rubber Bonding. 10.2 Sulphur and Sulphurless Vulcanization. 10.6 Control of Production Cures. 10.8 Common Defects in Vulcanizates. 11. Rubber in Seawater Systems. 11.2 Design Considerations in Seawater Corrosion Protecting System. 11.6 Specific Corrosion Protection Measures. 11.8 Trash Rack and Traveling Water Screens. 11.10 Condenser Tubes and Tube Sheets. 11.11 Piping, Pumps and Heat Exchangers. 11.13 Material of Construction for Seawater Based Systems in Nuclear Power Plants . 12. Rubber in Oil Field Environment. 12.5 Effect of Increasing Molecular Weight. 13. Calendering of Rubber and Coated Rubber Sheets. 13.6 The Art of Calendering. 14.2 Types of Moulding Process. 14.4 Moulding of Hollow Parts. 15. Service Life of Rubber-lined Chemical Equipment. 15.1 Materials that Improve the Ageing of Vulcanizates. 15.10 l Predicting Life of Lining. 15.11 Hydrochloric Acid Tank Lining Life. 15.12 Residual Life of Natural Rubber Lining in a Phosphoric Acid Storage Tank. 16.1 Case Study: Space Shuttle Challenger Disaster. 16.2 Case Study: Hinkle Reservoir. 16.3 Case Study: Ammonium Nitrate Explosion. 16.4 Case Study: "O"Ring Failure. 16.5 Case Study: Pebble Mill. 16.6 Case Study: Rubber and Ceramic Liners. 16.7 Case Study: Flue Gas Desulphurizing. 16.8 Case Study: Wrong Selection of Curing Method. Appendix 1. ASTM Elastomer/Rubber Designations. Appendix 2. Properties of Specialty Rubbers. Appendix 3, Temperature-Pressure Equivalents of Saturated Steam. Appendix 4. List of Suppliers Who Publish Technical Literature on Rubbers and Chemicals.